Need you garbage, rubbish or junk removed? Need help managing all the rubbish you build up? It doesn’t matter if you’re a homeowner looking to clear out old and unwanted clutter or a commercial builder who needs bricks, concrete and green waste transported offsite. Right Away Rubbish Removals is proud to deliver quick and affordable rubbish collection with a smile. If you are looking for an ace team of rubbish removal experts then you have found the right company That’s right! We have over 20 years of experience in this business and can offer you what no other domestic or commercial waster / rubbish removals company can; a real passion for cleaning up rubbish. Yes, we know it may sound odd, but that’s what we love doing and we do this better than anyone else. If your looking for cheap, affordable, price competitive SAME DAY rubbish removal, then we are the team to call – what are you waiting for? 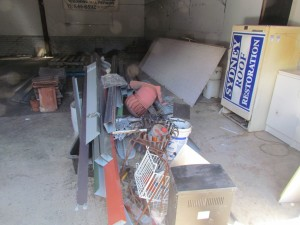 Ditch that unwanted rubbish piling up there in your back yard or building site and speak to Dean on 0418 444 093 – we can be there really quickly to take all the stress away and get rid of that rubbish! We don’t care what it is. Whether it’s old fridges tossed out or garden waste that’s been sitting there for months or even discarded mattresses, building waste or old computers. If you want it thrown out – we will handle it for you! Learn more about what kind of domestic, commercial and industrial rubbish we accept in our pickup service. If you have any questions about our service, please give us a call today. We will be there before you know it and have all that unsightly, ugly rubbish removed. If you manage a business that requires regular waste removal, Right Away Rubbish Removals can schedule a regular waste removal service, set at a convenient time for you. Whether it’s short-term or contracted on an annual basis, we have a waste management solution to suit all your needs and your budget. 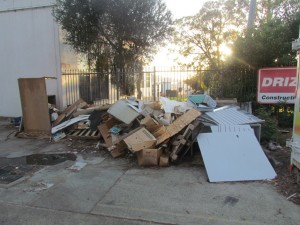 Why use a Sydney Rubbish Removals Service? # 1: your rubbish is cleaned up that day. Far too often it’s a real hassle to organise a skip bin, wait for them to arrive and hope that there is a space in front of your home or business. Skips are a hassle, time consuming and work out a lot more expensive than getting a team there that can alleviate the hassle of rubbish disposal for you. Also, with skips you get neighbours dumping their own rubbish at night while your asleep in your skip. # 2: once you make that phone call our team is there at your place in no time at all. The pile of dirty rubbish will soon be gone forever – now that’s total convenience. # 3: if you leave rubbish accumulating for too long, it does attract pests such as cockroaches, mice and other rodents. Plus you get scavengers rummaging through your rubbish which is dangerous and not environmentally friendly. Ideally, once it’s deemed as rubbish you do want it disposed of and gone once and for all. # 4: if you think you have the strength to do it yourself, think again! Best is to leave it to the professionals that clean up household waste and garbage day in and day out. All you need to do is make one wrong move and your back will be stuffed up for a long time. Think of all those chiropractic bills.